Recently, I was chatting with Who What Wear’s editorial director, Kat Collings, about some tops I’ve been seeing everywhere. You know, those blouses with details like puffy sleeves, floral voile prints, and covered buttons—and she referred to them as “nouveau milkmaid tops.” Of course, I thought. The delicate tops—with their pretty frills and sweetheart necklines—seem to be lifted right out of Sofia Coppola’s Marie Antoinette. Specifically, the scenes where the young queen set off to Le Petit Trianon, not far from the palace of Versailles, to escape court life. She would spend entire days at the hamlet playing the part of a milkmaid, wearing airy pieces just like these ones. To me, they’re a natural evolution of the off-the-shoulder tops and corset pieces that have been hugely popular over the last few years. But now, it’s the “nouveau milkmaid tops” that I’m crowning as the It piece of 2018. So this summer, as we slip into them, we can all play dress up just like Marie Antoinette. I decided to try out the “nouveau milkmaid” trend by wearing a top for myself. And let me tell you, I’m a huge fan. I actually wore this one for a recent date night. I’ve also noticed a micro trend within the category of these crop top versions with ruching. 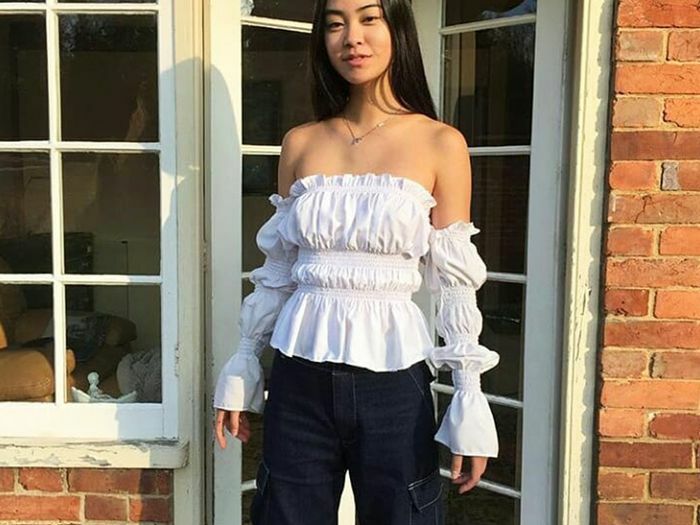 To me, the tops are a natural evolution of the off-the-shoulder top and corset versions that were popular over the last few years. Available in French sizes 34 to 40. One of my favorite new labels that specializes in creating these tops is Olivia Rose. An independent British brand, every piece is handmade to order. ﻿Available in sizes 4 to 14. Available in British sizes 4 to 14. I don’t know about you, but I’m going to wear these tops all summer long.